I love having Tea Parties. I used to have them quite a few years ago when my son was younger. I guess so many things were going on and I just never did get around to having another tea party until a few years ago. 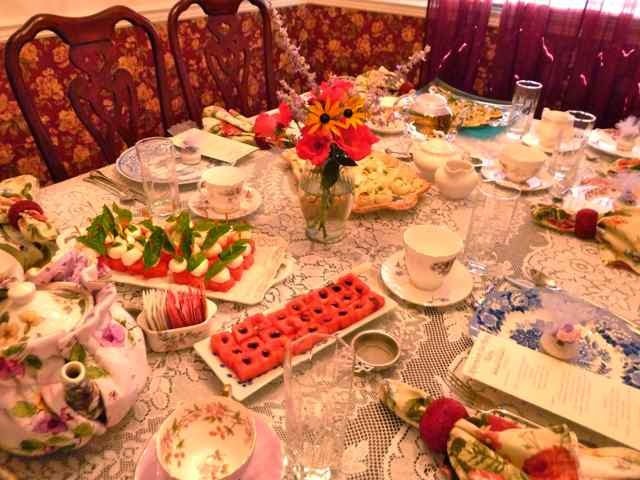 Now that I have reinstated this fun tradition, I have been having a Tea Party once a year, usually in the summer. It started with an English Tea Party, then a Southern one and last year a French one. This year I decided to do a little less work, or so I thought, so I made a “simpler” Crepe Tea Party. To set the mood I sent out a formal invitation via e-mail. 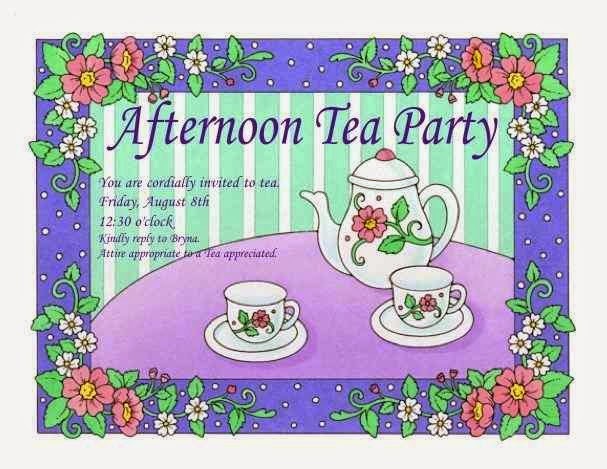 I made the invitation using a program called Print Shop. It is also possible to make them with the document program that comes with your computer. Of course, you can use real paper and snail mail the invitations. No matter how simple the party, it is important to plan. First I make a theme and a menu. I gather all the recipes together and make a shopping list. The week of the tea I plan out the execution of the event. I make a list by day of the week of what needs to be done. My list includes, shopping, setting the table, making place cards and menus, making favors as well as the actual food preparation schedule. At this point, as I see on paper what needs to be done each day, I edit the menu. If there is really just too much to do and I have no help, I eliminate something and streamline the menu. Run to the store to get fresh mozzarella balls, fresh corn and tomatoes. Clear salad plates and have guests go to make their own savory crepes at crepe station. 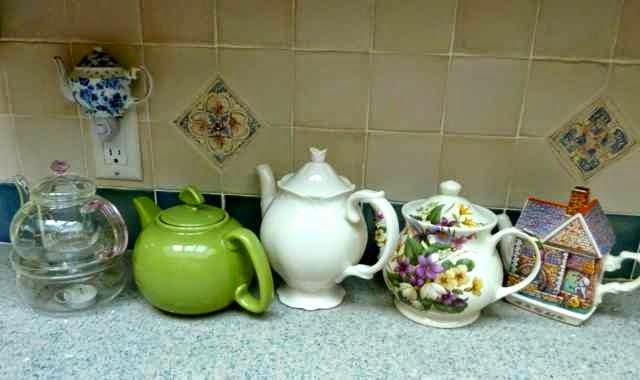 Tea pots for hot teas. Making the savory crepes a few days ahead. Note the fresh parsley pieces. 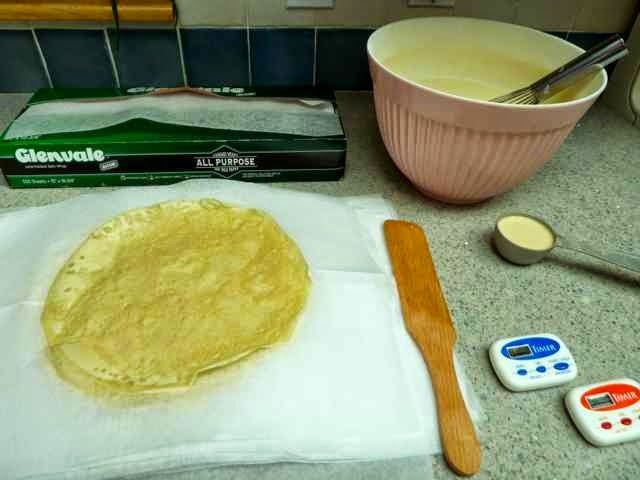 Crepes are separated with pieces of wax paper to keep them from sticking. My party does get a bit complicated as I adjust for dietary needs and preferences. For example, I had a dairy free guest and I made dairy free versions of four items. 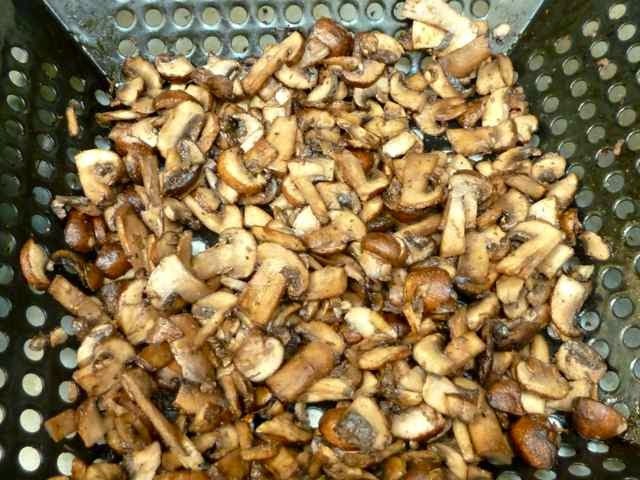 I also knew that one person did not like to eat mushrooms, so instead of mixing the mushrooms with the sautéed vegetables, I cooked and served them separately. Two people do not eat cucumbers, so for my cucumber appetizer I used lightly steamed zucchini when making theirs. One friend was recovering from a recent foot surgery and had to keep her foot elevated. I set her up with a pretty foot rest and a corner seat so that she could be close to the table while still keeping her foot up. I like to make all my guests feel comfortable and welcome. Everyone appreciates all the extra effort and this makes for a truly special and memorable occasion. Sautéed vegetable medley, one of the savory crepe fillings. 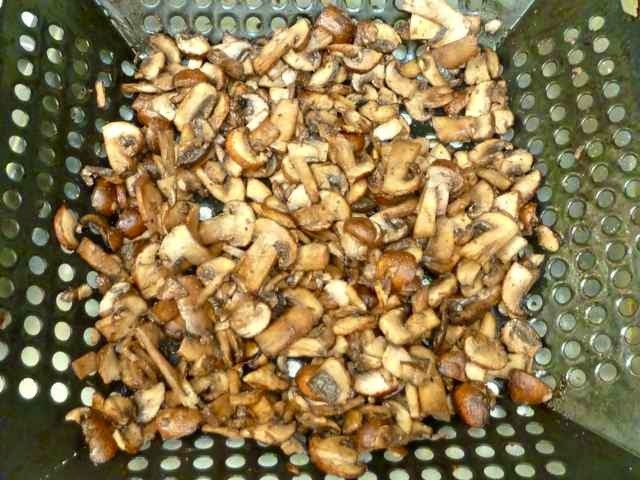 Mushrooms cooked separately (on the grill) another one of the crepe fillings. A corner place setting and foot stool for a friend with recent foot surgery. It is necessary to do as much as possible in the days before the Tea so that you can be more relaxed and enjoy the party with your guests. 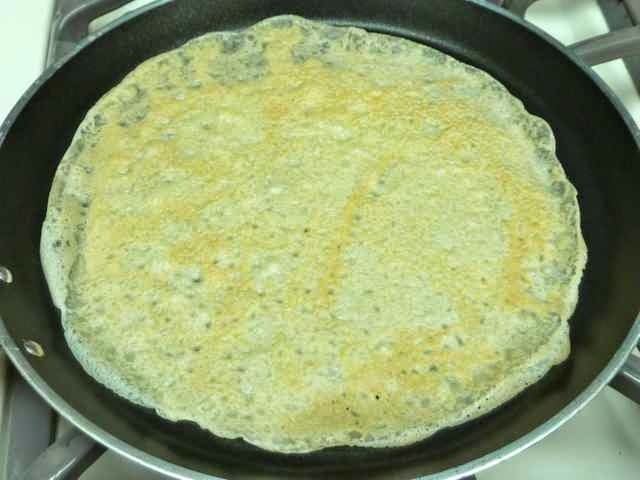 Crepes can be made several days ahead and kept well wrapped in the fridge. Party favors can be made weeks before the party if you know who will be coming that far ahead. For this Tea the favors were small porcelain boxes with flowers on top. The boxes were filled with rose scented French pastilles and then were wrapped with tulle and ribbon flowers. With name tags attached to each favor they made pretty place cards. I print the menu and place cards the day before, because at that time I know who is coming and what I actually will serve. 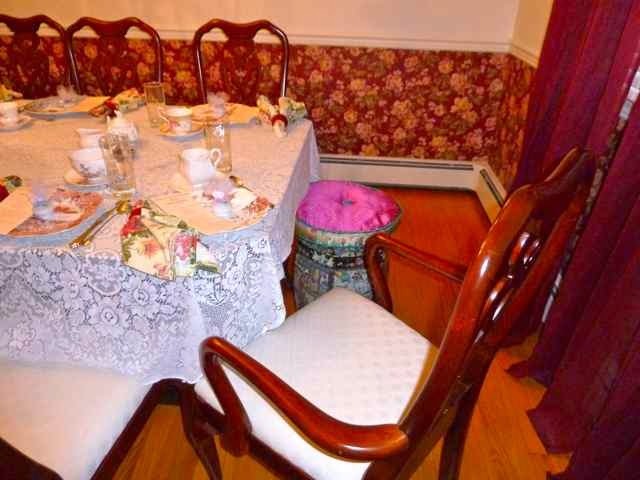 I set the table at the beginning of the week since I have a separate formal dining room that is not needed for weekday meals and won’t be in anyone’s way. 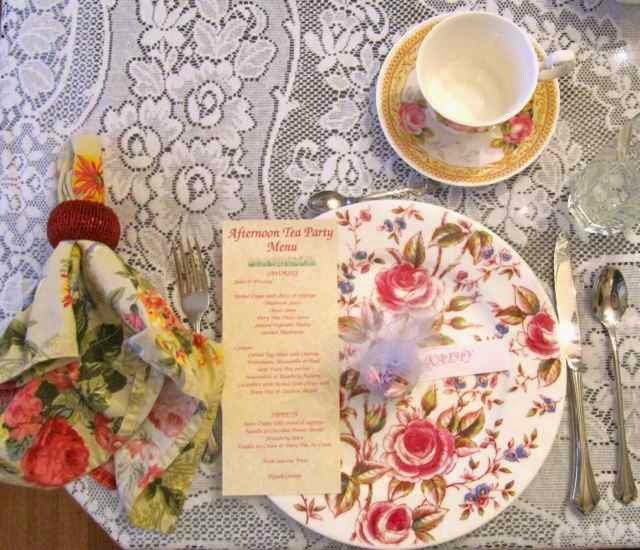 If one person more or one less comes, it is easy to add or take away a place setting. I also look around the cabinets to make a mental note of what serving dishes I have that will work well with what I am serving. One place setting with a name tag favor and a menu. Each place setting had a different plate and tea cup. I do my shopping at the beginning of the week. Some items must be purchased the day before, but most things can be bought four or five days ahead. For this menu I made the crepes and set the table three days before the tea. I cleaned and chopped the vegetables, made the cheese sauces and the strawberry sauce two days before. The day before the Tea the vegetables were cooked, the fruits and vegetables for the canapés were cut, all the canapé fillings and toppings were made and the Pignoli Cookies were baked. The day before the tea I went to the store for a few items that had to be very fresh, mozzarella cheese, fresh corn and cherry tomatoes. 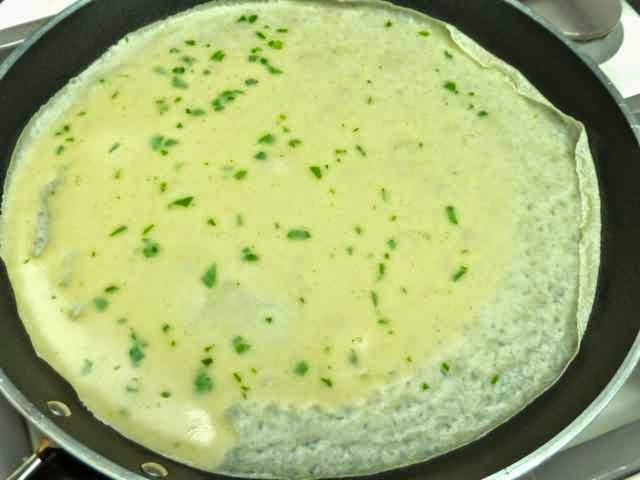 The morning of the Tea, the salad was made, the canapés were put together and plated, the crepes, vegetables and sauces were heated, and a crepe station was set up to serve the savory crepes first. Hot teas were made after guests arrived and we decided which ones we wanted. Friends brought prepared iced teas, some loose and flowering teas, and fresh cut up fruit. 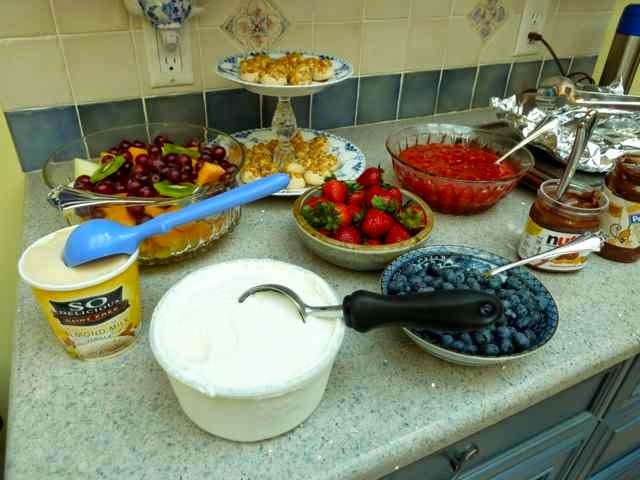 After the savory foods were devoured, the dessert crepe station was set up. 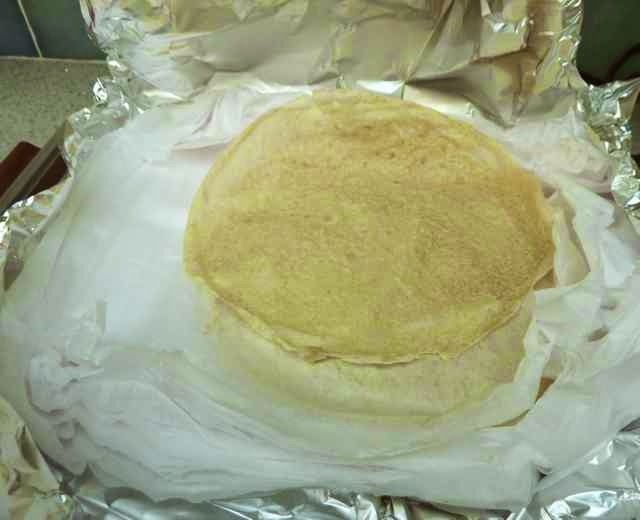 The crepes were kept warm wrapped in foil and resting on a hot plate. 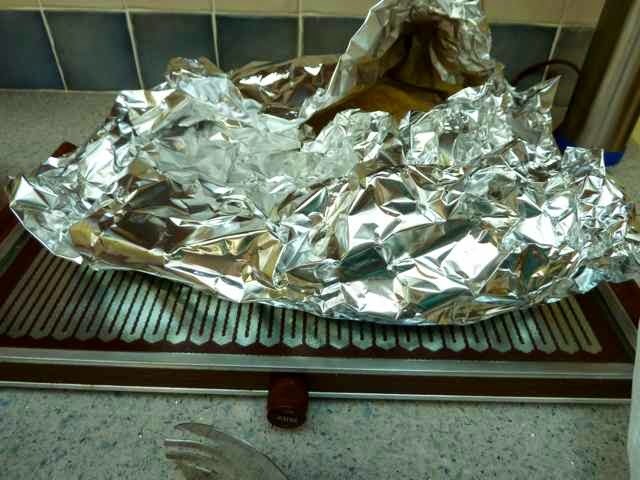 Guests would open the foil, take a crepe and then close the foil afterwards. As usual, after I got a bit busy serving and eating I forgot to take some photos of things such as the savory crepe station and the savory and sweet crepes all put together on a plate. One friend was so proud of her dessert crepe that she took a photo, so you can get idea of how they looked from that one photo. Everyone’s crepes were a bit unique. Some had sauce on top, some inside, some with lots of filling some with less. Take my word for it, they all looked and tasted fabulous! Dessert Crepe with fruit and a Pignoli Cookie on the side. Much of what I served, were foods that I had made before and the recipes are already on my blog. 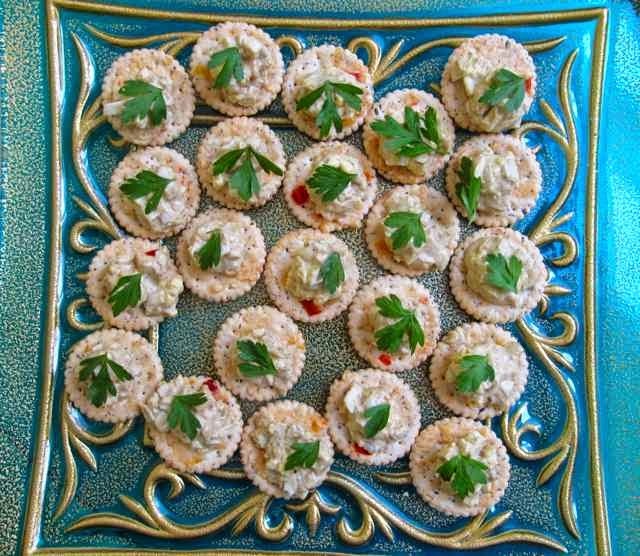 The canapés and salad were chosen to be refreshing for a summer day and the recipes will be on my blog soon. 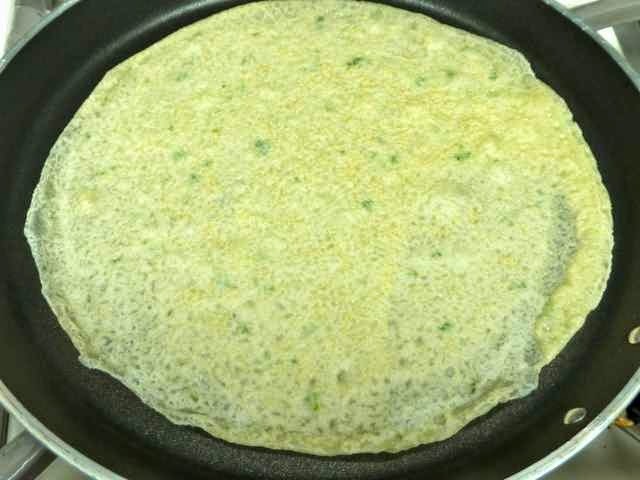 The savory crepe recipe is a new one and I will be posting it shortly. 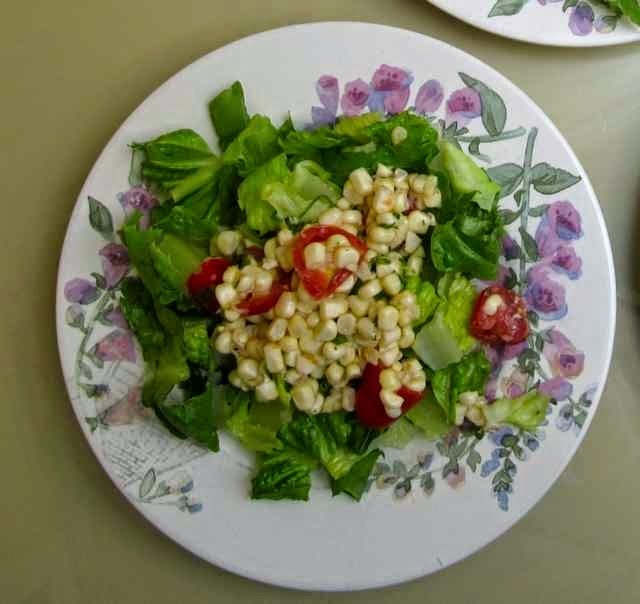 Corn and Tomato Salad with Cilantro Lime Dressing. 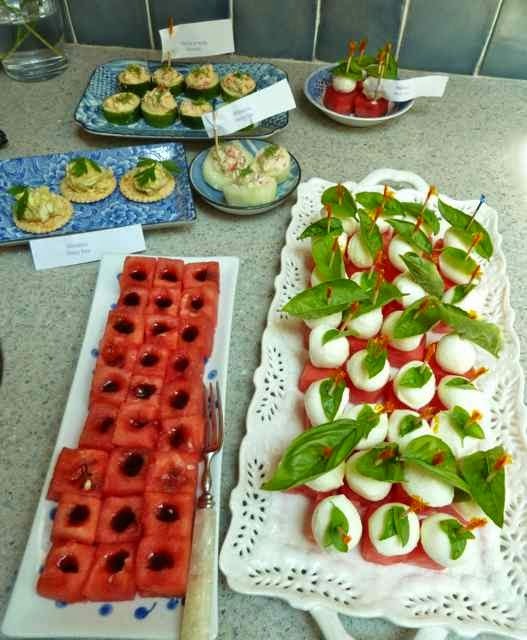 Watermelon Canapés in front. On left with Raspberry Balsamic. On right with mozzarella cheese balls and fresh basil from my garden. and the zucchini version of the cucumber appetizer. topped with fresh parsley from my garden. 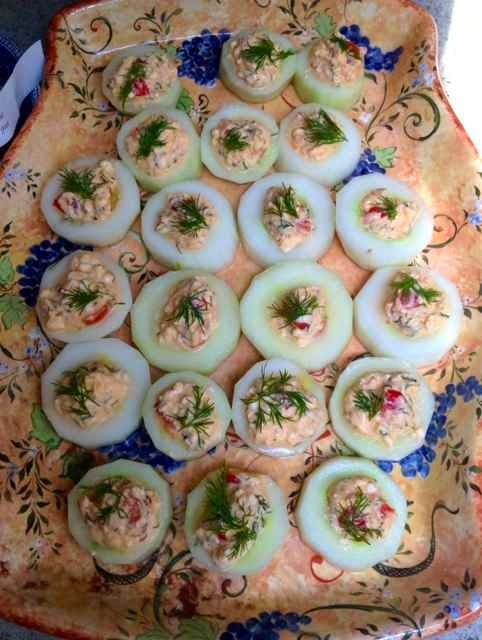 Cucumbers filled with Herbed Feta Cheese. 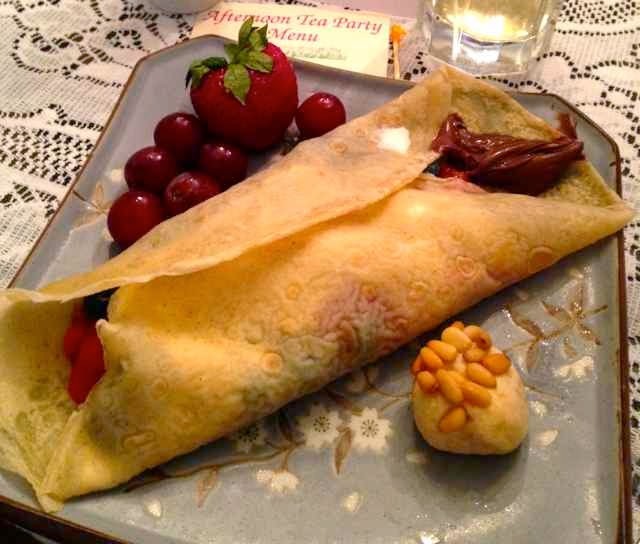 The GF Crepe Tea Party was a great success. We all had a wonderful time talking, laughing and, of course, eating. The Tea began at 12:30 and we were having so much fun that, when the party began to wind down, we were quite shocked to realize that it was already 6:00! I had a hankering for pancakes. I keep seeing them in the grocery store freezer and then I don’t buy them because I tell myself that I can make them better and for less money. This is very true, but then I never seem to get around to making them. Finally, I did it! 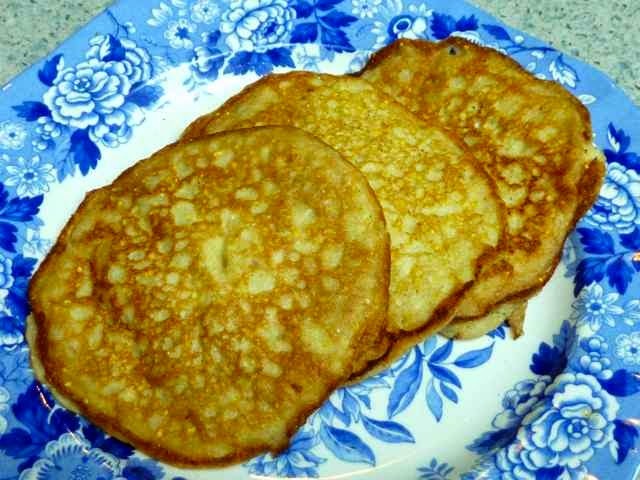 This recipe, The Only Pancake Recipe You’ll Ever Need, is one I found on-line and decided to try. It was someone’s secret family recipe. I converted the recipe to gluten free. I will say that the taste is outstanding, but the pancakes are a teeny weeny bit heaver than I would like. My testers loved them, no complaints at all. Next time, and there will be a next time since they tasted so good, I will separate the egg, and then whip and fold the egg white into the batter. I think then they will be the perfect lightness for me. 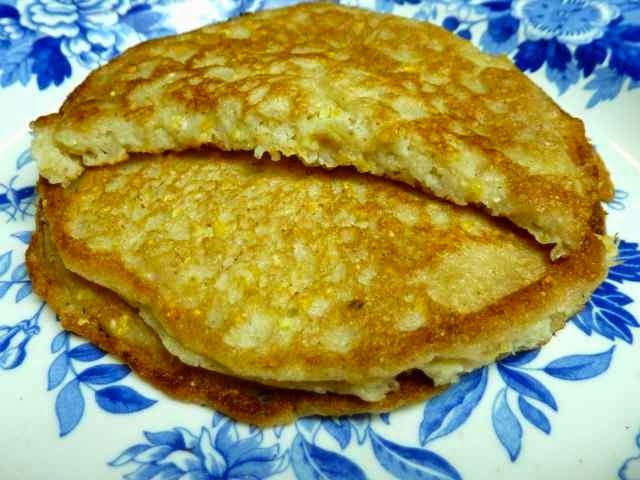 Pancakes are fairly easy and fast to make. There are a few tricks to getting them right. 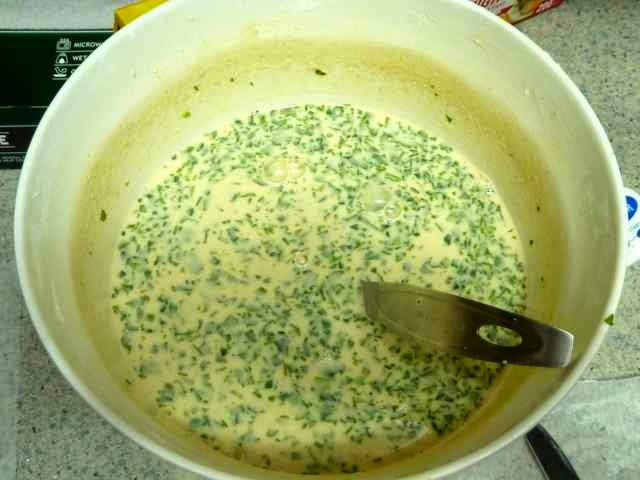 The first thing to know is how to mix the batter. First mix all the dry ingredients in one bowl and all the wet ingredients in a separate bowl. Add the wet ingredients to the dry ones and stir in until just combined. A few lumps are fine. 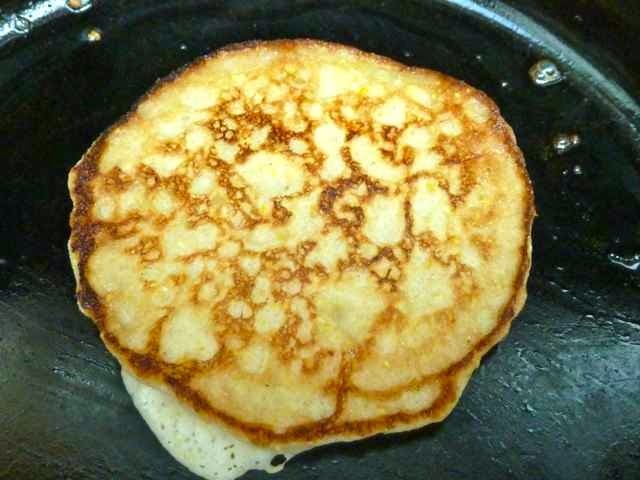 Do not mix the batter too much or you will have a denser pancake. To make an even lighter batter you can separate the eggs and whip the whites. Add just the yolks to the wet ingredients and then, after the wet and dry ingredients are mixed together, fold the whipped egg whites into the batter. The next thing is knowing how to cook the pancakes correctly. The pan has to be very hot before you start. I preheat the pan and then I test the heat by sprinkling some water on the pan. If the water balls up and rolls then the pan is hot enough. If it just sizzles and evaporates, not hot enough. The flame can’t be too high. A medium (on the low side) heat is best. If the flame is too high the pancakes will be very browned and possibly burnt on the outside before they have time to cook in the middle. You can make a sacrificial pancake to test the flame and adjust the flame down or up to make the color pancake that you like. Pour the batter onto a well greased hot pan. Butter burns quickly, so it is best to use oil or cooking spray (I use butter anyway, because I love the taste). Let it cook on the first side until bubbles form and the edges of the pancake are dry. Then flip it over to cook the other side. Never press down on the pancakes with a spatula or they will become deflated, heavy and dense. Pancakes are best served as they cook. If you want to make many pancakes and then serve them all at once, then keep them warm in a low oven, 200° or less. Be sure to spread them out on a baking sheet in one layer as you keep them warm. If they are piled on top of each other they will get dense and soggy. I love real maple syrup on my pancakes and some butter. You can put fruit, yogurt, granola, nuts, chocolate chips, etc., on top. Some people like to add some blueberries, nuts, chocolate chips or granola to the batter. Bacon in pancakes is all the rage these days too. Add to the batter or top off the cooked pancakes with whatever you like. If you add blueberries to pancakes, do not mix them into the batter or it will turn blueish purple (if you want blueish purple pancakes then go ahead and mix them in). To keep the batter its original color, pour the batter onto the pan and then put blueberries into the wet batter of each individual pancake. Dab some batter on top of the berries to cover them better if you like. In a large bowl add the egg, milk, salt and oil, combine well and set aside. 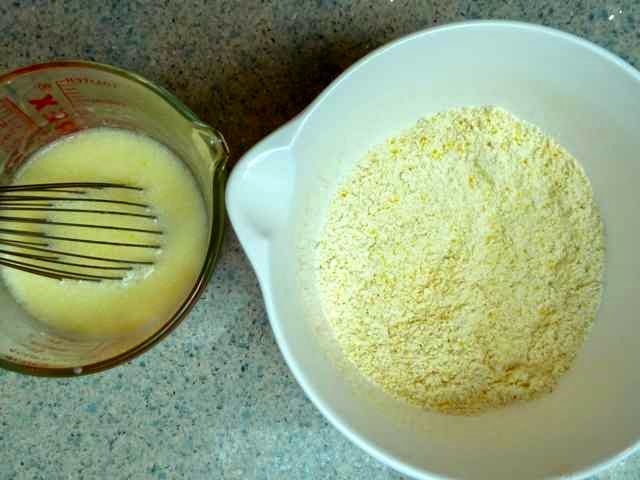 In a separate bowl mix the flours, corn meal, xanthan gum, baking powder and sugar until well combined. Wet ingredients and dry ingredients in two separate bowls. Add the egg and milk mixture to the flour mixture. Stir until just combined. A few lumps are a good thing. Wet ingredients poured into the dry ones. Heat a 10” skillet until very hot. A sprinkle of water will form a ball and roll across the pan when it is hot enough. Test a small amount of batter on the pan to see if the flame is too high or low. If the outside of the pancake is too dark or burnt lower the flame. If the outside is too pale for you raise the flame. Wait a few minutes for the pan temperature to adjust before cooking the rest of the batter. Grease the pan with butter or oil and pour 1/4 cup of batter onto the pan. ¼ cup of batter just poured onto a greased and very hot cast iron skillet. 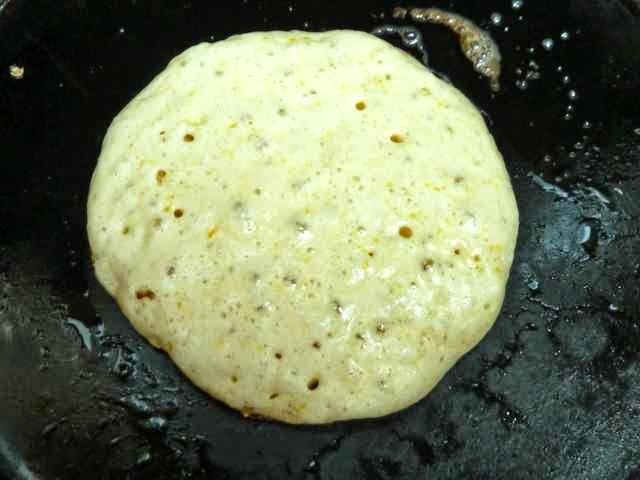 When the top bubbles and the edges are dry, flip the pancake and cook the other side. Do not press down the pancake with your spatula or it will deflate. Pancake after cooking about a minute. Note the bubbles and the dry edge. Pancake flipped over to cook on the other side. Repeat this process until all the batter is used. Serve the pancakes as they cook for the best texture. If you want to serve them all together, then keep the pancakes warm in the oven. Spread the cooked pancakes out on a baking sheet in one layer. If pancakes are piled on top of each other they get soggy and dense. Serve with butter and real maple syrup, my favorite, or with toppings of your choice. Enjoy! GLUTEN FREE PANCAKES Makes about 10 pancakes glutenfreebakingbear.com Ingredients 1 large Egg 1/2 tsp. Himalayan Sea Salt 2 Tbs. 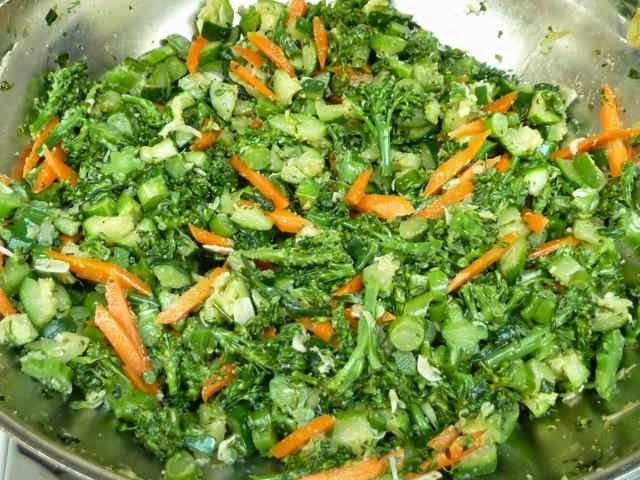 Canola or light flavored Vegetable Oil 1/2 cup Sorghum Flour 2 Tbs. 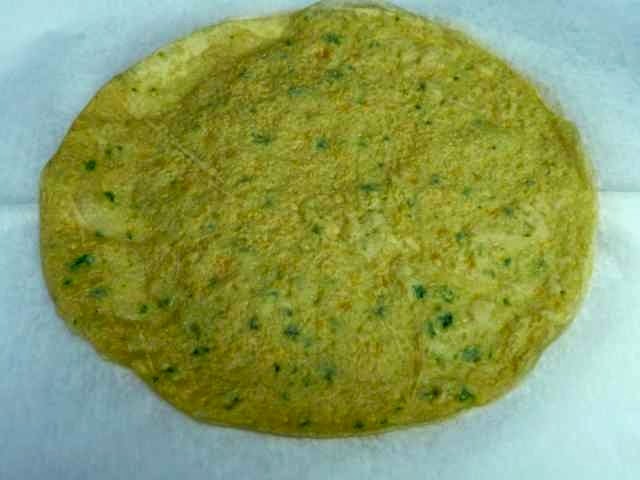 Chickpea Flour 6 Tbs. Tapioca Flour 1/2 cup Corn Meal 1 Tbs. Baking Powder 1/2 tsp. Xanthan Gum 1 Tbs. Sugar 1½ cups Milk (for Dairy Free use non dairy milk) Butter or Oil for the pan. 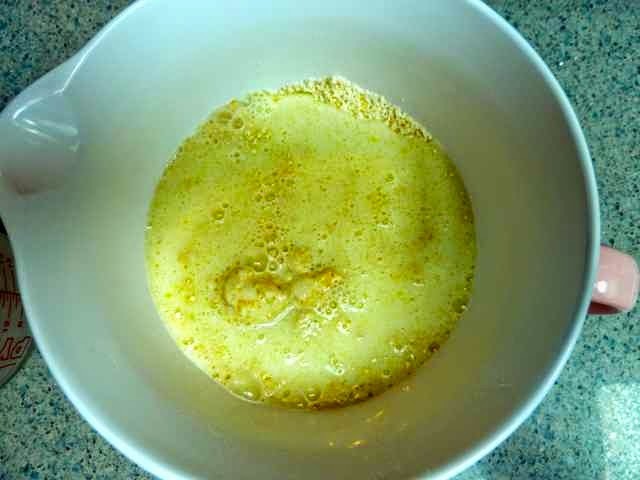 (for Dairy Free use oil) Directions In a large bowl add the egg, milk, salt and oil, combine well and set aside. In a separate bowl mix the flours, corn meal, xanthan gum, baking powder and sugar until well combined. Add the egg and milk mixture to the flour mixture. Stir until just combined. A few lumps are a good thing. Heat a 10” skillet until very hot. A sprinkle of water will form a ball and roll across the pan when it is hot enough. Test a small amount of batter on the pan to see if the flame is too high or low. If the outside of the pancake is too dark or burnt lower the flame. If the outside is too pale for you raise the flame. Wait a few minutes for the pan temperature to adjust before cooking the rest of the batter. Grease the pan with butter or oil and pour 1/4 cup of batter onto the pan. 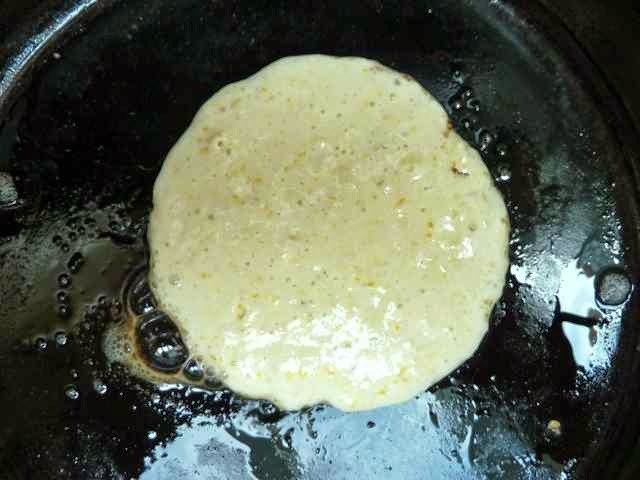 When the top bubbles and the edges are dry, flip the pancake and cook the other side. Do not press down the pancake with your spatula or it will deflate. Repeat this process until all the batter is used. Serve the pancakes as they cook for the best texture. If you want to serve them all together, then keep the pancakes warm in the oven. Spread the cooked pancakes out on a baking sheet in one layer. If pancakes are piled on top of each other they get soggy and dense. Serve with butter and real maple syrup, my favorite, or with toppings of your choice. Enjoy!